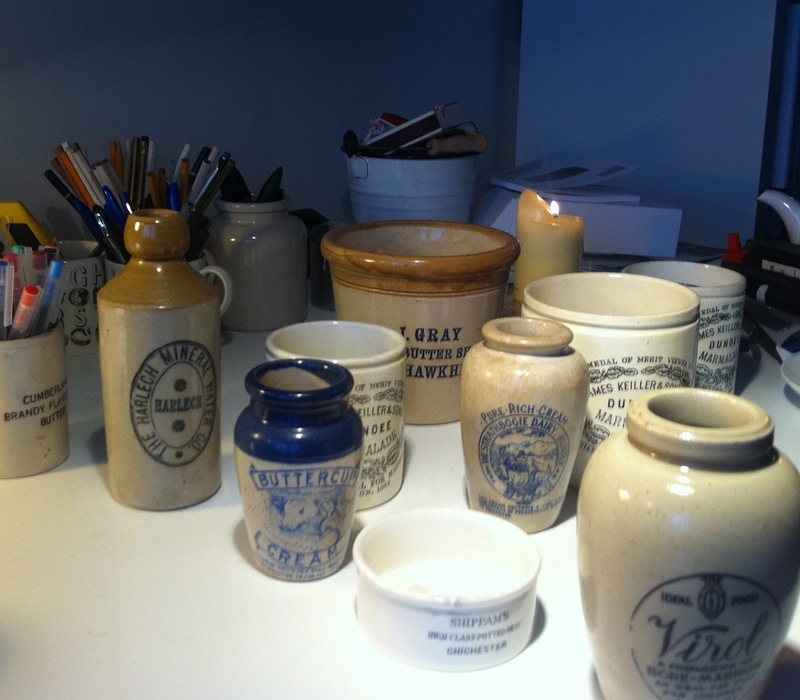 Jeremy Lee, chef, on his collection of storage jars. GB Tell me why you’ve chosen your pots. JL You ask why I volunteered the pots. Ah, well, they are in themselves rather beautiful, the glazes, the varying shapes and differing sizes. The lettering and wording used by the various butchers and grocers, dairies and manufacturers of comestibles are all quite beautiful in their own ways too. They are pleasing and cheering whenever you see them. GB Are they useful – apart from for keeping pens in? Does a lot of their beauty come from nostalgia? JL Useful? Oh indeed, apart from being very well sized for littering a desk or table with the great many pens and pencils I need as I am hopeless at keeping a writing implement upon me. It is a good day when I can keep a pen for even a few hours. And again, they are rather cheery. Nostalgic, unashamedly. Strangely, folk write about our lack of food culture back in the day. These little pots sweep such ill-considered comment out the door. To think that once, every village and town had a dairy, grocer & co who had a pottery make such lovely things to sell their wares. There was a culture then that celebrated craft as daily, civilized life. Nowadays? GB Is it important to you that you work with beautiful things in the kitchen? JL Beautiful produce is vital to make good things. Most working kitchens banish all hope of glamour pretty quickly, in seconds usually so I find the dreamy Vaseline-lensed view of the kitchen rather amusing. However a handsome pot, a beautiful knife, a splendid chopping board do make for cheerier comrades in the kitchen, at home in particular. GB Can the visual beauty of food ever over ride the other senses – fool you into thinking something tastes better than it does? JL Such an interesting question. The great delight of walking through markets piled high with splendid produce is still the greatest inspiration to the cook, not to mention those who notice the good things and love being inspired. We almost lost this culture completely and it is slowly restoring its place as part of daily, civilized life. The curiosity of still trying to produce such dazzle on a plate remains an enigma. GB Cicero thought that the greatest pleasures are only narrowly separated from disgust. Have you ever had to overcome an initial revulsion to fall in love with a food? I might have to do this with bone marrow for instance! JL Ah, Cicero… To what craft does that not apply? Generally, more so, with the company at table rather than the bill of fare! Oops, sorry, only joking. There are no foods that I can think of within Blighty that would be spurned except thro poor cooking and preparation, although I do confess to never eating pasta, except when made by angels. JL Oh gosh, could it just be that something so well considered pleases not only the eye but the soul that brings forth an easy smile? There is much to please in a considered piece with a seemingly artless charm to it.